Your phone is going to go off at 1:18 pm (central time) Wednesday, October 3 as a test of a new nation-wide alert system. What is this new alert system about, and can you opt out? I have all of those answers right here for you! The new system, which is similar to the Emergency Alert System (EAS) that radio and television stations use to relay important messages, will utilize phones to pass important messages to the public. This Wireless Emergency Alert (WEA) system will be used to pass along emergency messages sent by authorized government alerting authorities through your mobile carrier to your phone. Government partners include local and state public safety agencies, FEMA, the FCC, the Department of Homeland Security, and the National Weather Service. With a significant majority of Americans always having a cell phone with them, this natural addition to the broadcast EAS platform to alert the public expands the ability to share important information with the public in a timely manner. The message delivery does not cost anything (doesn't count against your data/text plan). While it will display a prominent message during most activities on your cell phone, it is not supposed to interrupt phone calls. Rather, the alert message will be delivered after you end your call. MORE: No, Trump Didn't Text Your Phone. Here are the test facts. What type of alerts will you recieve? How will these alerts differ from other phone alerts? Our phones go off a lot, with text messages and app notifications making our phones vibrate and sound off several times a day. WEA messages will include a special tone and vibration, both of which repeated twice when a message is delivered. How will location-specific alerts be delivered? Are phones being tracked? Weather alerts and AMBER Alerts are sent specifically to people in certain geographic locations, so only the people in a specific area will be alerted of these location-specific events. Notifications will be sent to everyone with a WEA-compatible phone using a cell tower within the area of the alert, which means that phones are not being location-tracked. Most modern phones are WEA-compatible, but you can get more information about carrier and device information here. Can these alerts be turned off? All types of alerts, except for Presidential/national emergency alerts can be shut off on your device by opting out of the service. The opt-in/opt-out process varies from phone to phone. Some phones allow you to do this right in the phone's settings, while others require help from your cell carrier. Basic information is available from the Cellular Telecommunications Industry Association (CTIA) website, while more specific information can be gathered from your cell provider and/or your phone's user manual. 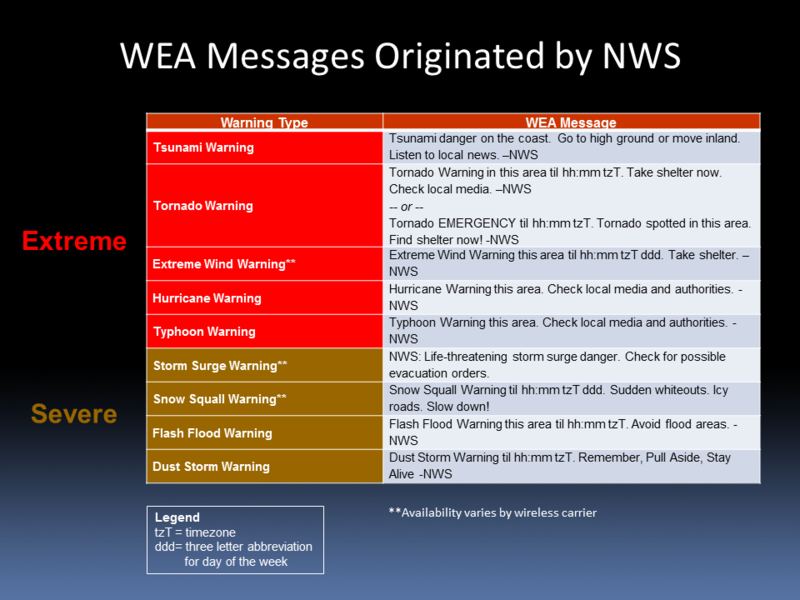 The National Weather Service has a detailed FAQ on the new WEA system, which you can see here. Additionally, FEMA has a fact sheet about the test, which answers a number of common questions about the test and WEA system.